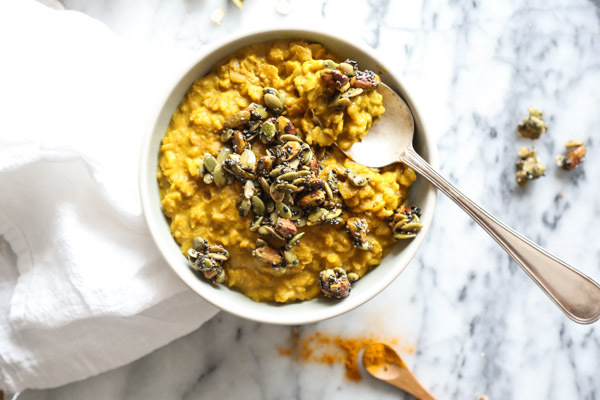 Ever since ExpoWest, when you couldn’t turn a corner without running into a new turmeric product, I’ve been dying to try my hand at a golden milk recipe. This vibrant, frothy concoction is deeply rooted in Ayurvedic medicine for its anti-inflammatory healing power. My general rule of thumb for any type of anti-inflammatory eating is to eat the rainbow—a little trick that my acupuncturist, Heidi, taught me. And turmeric is pretty much as colorful, and as versatile to cook with, as it gets. I was excited to see at the Expo that many brands are now introducing their own Golden Milk powders and pre-mixed elixirs in paper cartons (much like you would buy your regular almond milk). If you’re lazy and want to make sure you have a shot of Ayurvedic Advil on hand at all times, Gaia Herbs makes a great one. But otherwise, making your own is stupid easy. 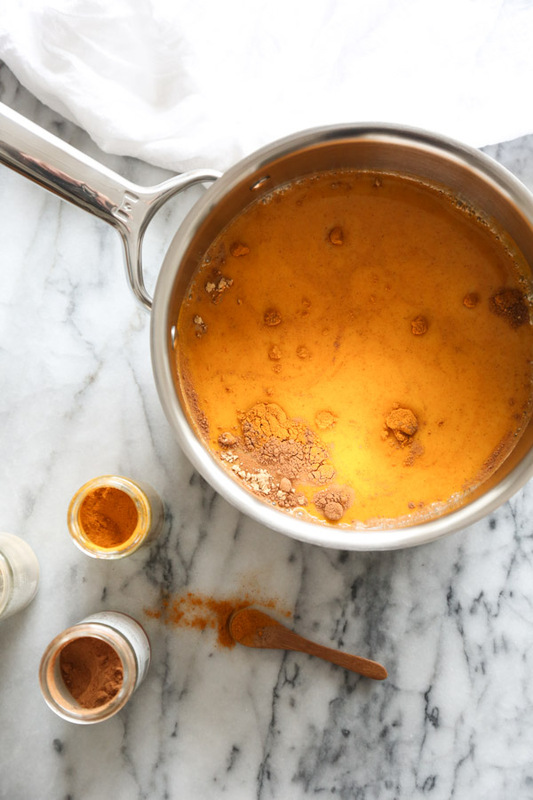 Combine turmeric, dairy-free milk, a little sweetener (honey or maple syrup, for the vegans) and whatever other spices you like (cinnamon and ground ginger round it out well—but you can also add cocoa!). Heat it until warm and well-mixed (being careful not to boil over). And boom. So to keep things interesting for you fine folks, I went a little rogue on the breakfast front and decided to make golden milk the base for my morning oatmeal. 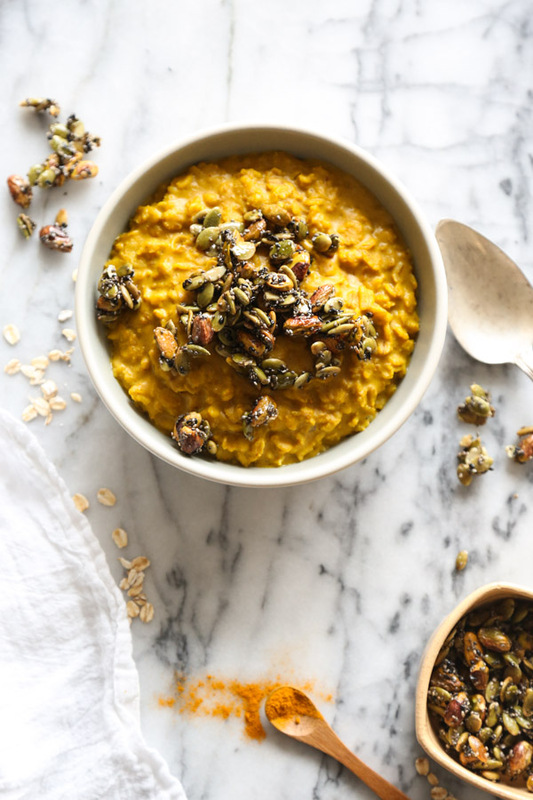 Not only does it give your porridge a beautiful sunshine hue, but it also adds even more health benefits to an already wholesome bowl of whole grains. 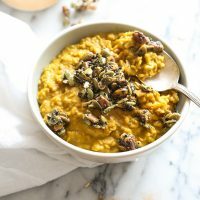 Turmeric is kind of an acquired taste, so if you find the golden milk base bitter, add a little more maple syrup or honey. 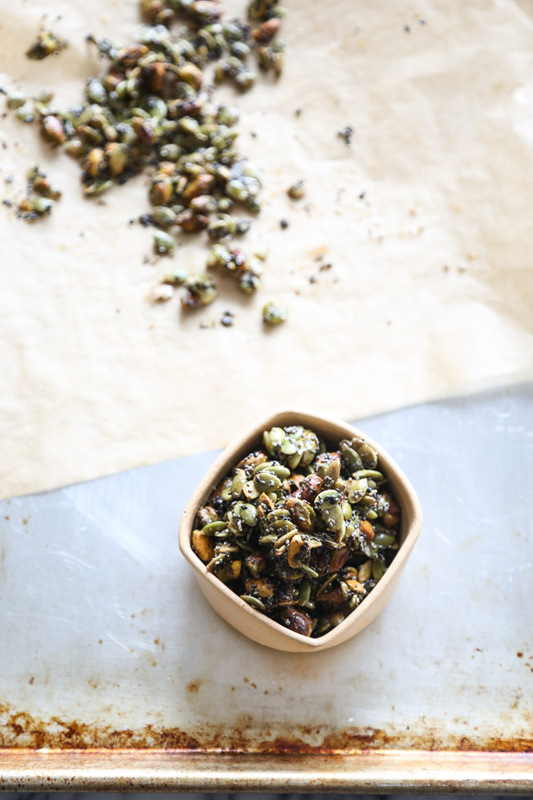 But also keep in mind that you’re going to get another pop of sweetness with the pepita brittle! 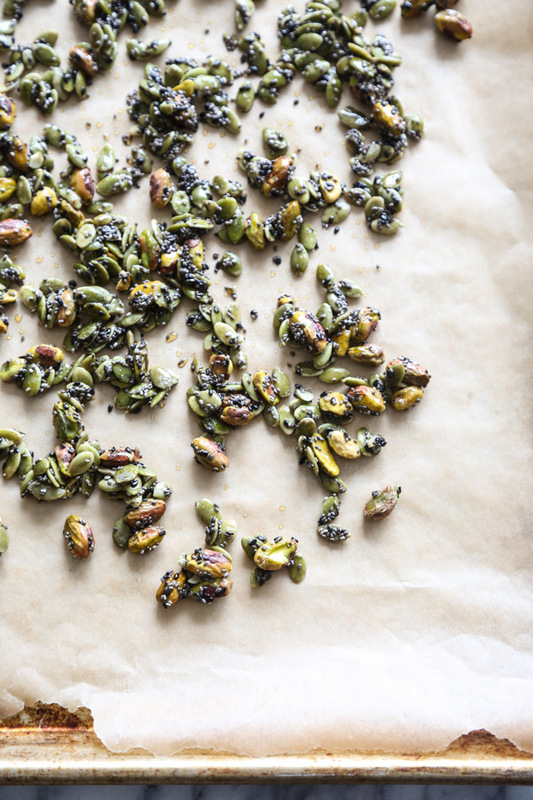 This combination of nuts and seeds is so addictive. 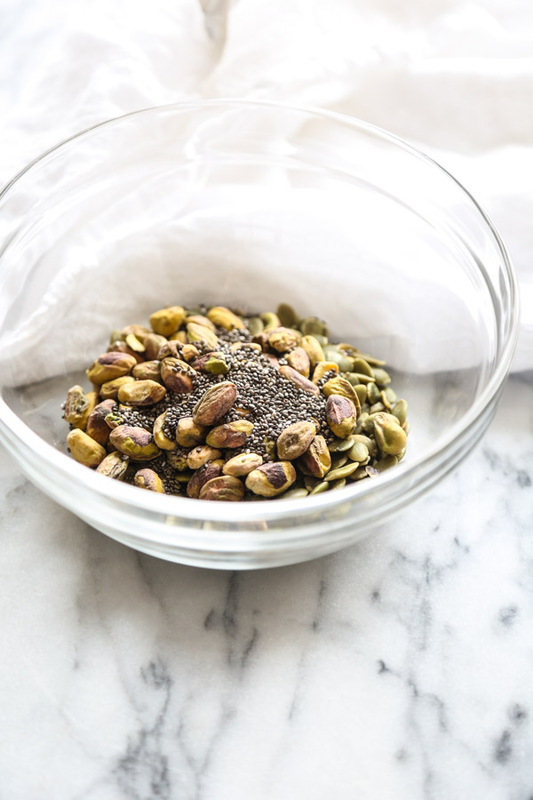 It’s also endlessly customizable, so if you don’t have pistachios, chia seeds or black sesame on hand, feel free to substitute with almonds, cashews, hemp seeds—anything really. It takes only 4 minutes to toast and caramelize under the broiler. But you can also make the brittle in advance. It will keep in an airtight container for up to a month. I highly recommend a double batch for snacking. 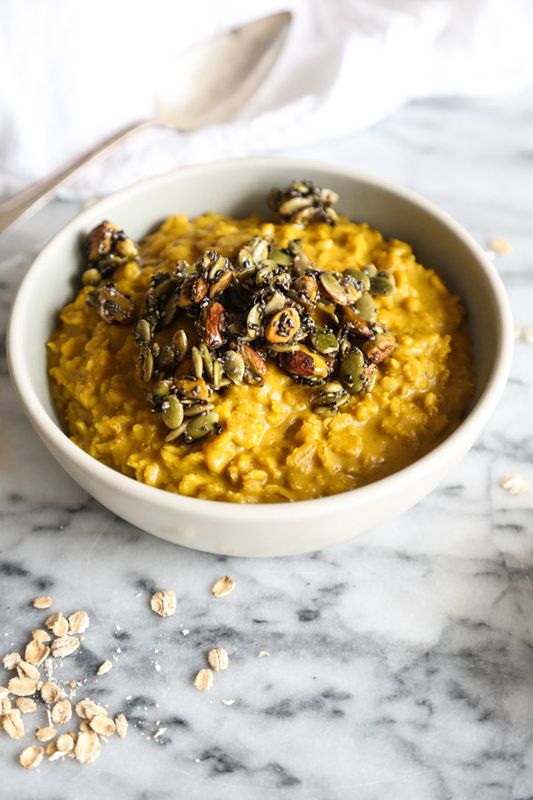 As for the oatmeal itself, I like making a big batch at the beginning of the week and cooking it until al dente—for gluten-free rolled oats that’s about 10 minutes—and then microwaving individual portions throughout the week. Lastly, because of previously mentioned laziness, I use dried ground turmeric for this recipe. But if you can find it, definitely give it a go with fresh turmeric! The general rule of thumb for fresh versus dried spices and herbs is to use 3 x the amount of fresh. It tends to be milder, but tasting as you go is always a safer move. With fresh you don’t have to worry as much about getting rid of that chalky texture, so you can doctor with more if you like. In other news, I just got back from a restful week of writing on the vineyard, which was rounded out by a slightly less restful weekend of “tastings” at the MV Wine Festival. Needless to say, many anti-inflammatory foods are in my future this week, because I still love my liver and all. Do you have any favorite uses for this super spice? Let me know your turmeric ideas in the comments! 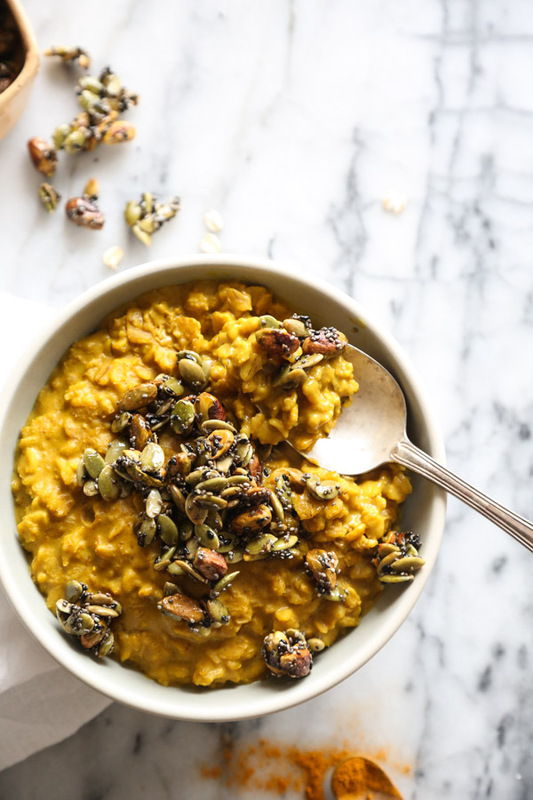 This easy vegan oatmeal recipe uses turmeric-rich Golden Milk as the base, and is topped with pepita brittle. It's both vibrant, healthy and delicious! 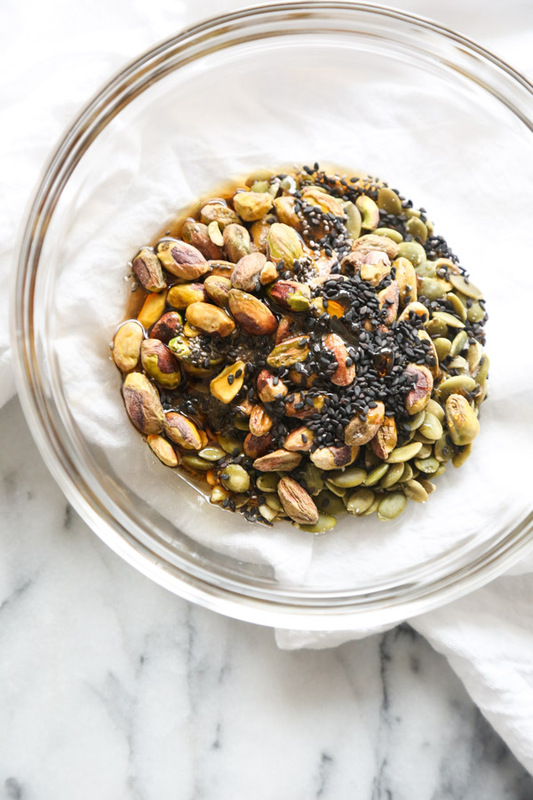 In a medium mixing bowl, combine the pepitas, pistachios, chia seeds, sesame, maple syrup, coconut oil and sea salt, and toss until evenly coated. Spread the mixture on a parchment-lined baking sheet. Roast under the broiler until toasted, 4 minutes, stirring once halfway through to prevent uneven cooking. Allow the seeds to rest on the baking sheet until cooled slightly. Toss to make sure the remaining syrup adheres, then allow to cool completely. Break apart into chunks and store in an airtight container until you’re ready to make the oatmeal. 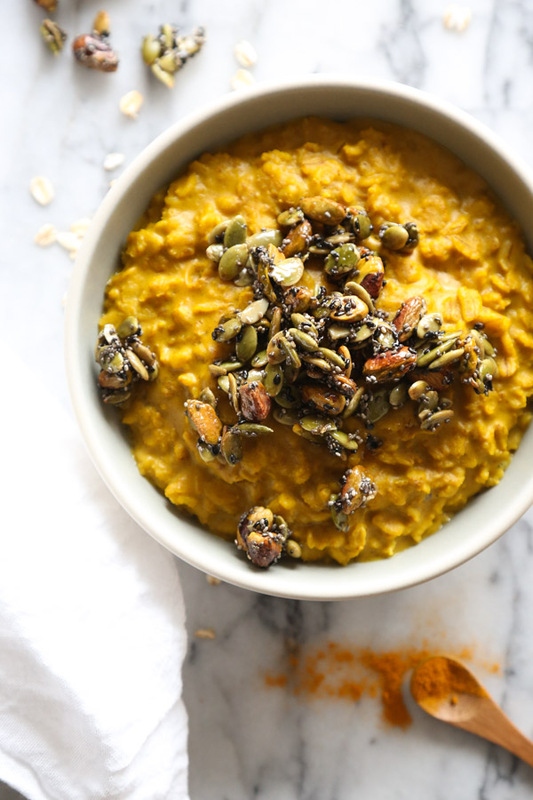 In a medium saucepan, combine the coconut milk, maple syrup or honey, turmeric, cinnamon and ground ginger. Bring to a simmer, whisking until everything is well-combined. Be careful the pot doesn’t boil over! As soon as bubbles form, add the oats and reduce the heat to medium-low. Cook, stirring occasionally, until the oats are tender and the liquid is absorbed, about 10 to 15 minutes. Ladle the oatmeal into bowls and top with the brittle. Serve along side extra maple syrup for more sweetness. If you want to use steel cut oats or quick cooking oats, just check the package instructions and increase or reduce the amount according to their pre-set ratios. You’re working with 2 cups of liquid. You can make the brittle up to two weeks in advance. The oatmeal can be made at the beginning of the week and reheated in the microwave in individual bowls. If you’re making the oats in advance, add ½ cup water and cook just until the oats are tender. Wow, this is one of those recipes that makes me wonder, “why didn’t I think of that? 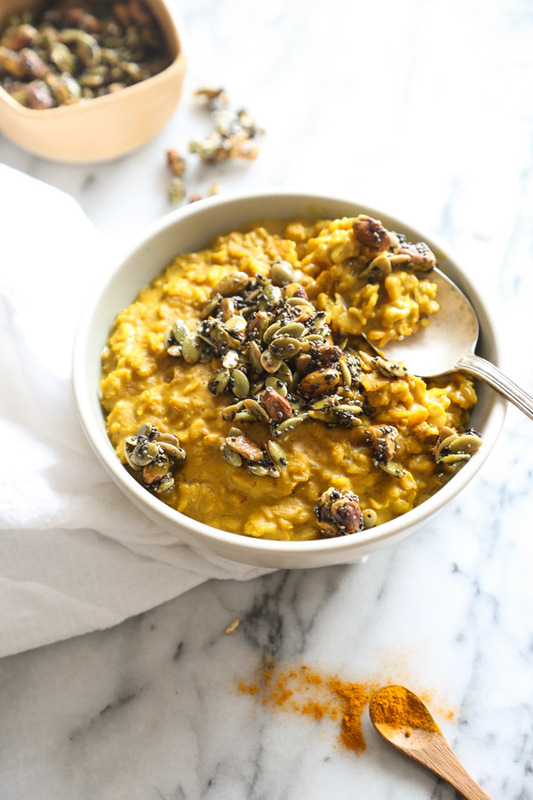 ?” Turmeric milk oatmeal, brilliant!!! I keep hearing about ExpoWest and am crazy jealous of everyone who got to go. Thanks for sharing this recipe! That porridge is so pretty. This looks lovely! I can’t wait to try it! Regarding golden milk on the go, do you have any preferred thermal containers for carrying it as a hot beverage to work? I did it once in a Starbucks plastic (gasp!) thermal travel mug and could never get the turmeric stain out. This is simply stunning, my friend! A dream bowl of oatmeal right there! This sounds amazing! Do you think you could do the oats in a slow cooker? Not totally positive on this one Courtney! I usually only use steel cut oats in the slow cooker with a ratio of 1 cup oats to 4 cups liquid, cooking for 5 hours on low. Definitely feel free to adapt for this technique! Otherwise, they come together really quickly on the stove and you can make ahead and reheat portions if you like 🙂 Let me know how it goes! mmmm all that sounds wonderful Laurie! need to try it in dressings! I made this today and added a teaspoon of cardamon, my favorite spice, plus a pinch of black pepper. I didn’t have pepitas but topped the oatmeal with toasted almonds and it is delicious. Thanks for a great recipe!